One of the wonderful things about living out here is all the fresh produce. OK, it's a little slow to start this year, and the bugs were *ahem* KIND enough to eat my lettuce, but there's always the farmers' market. I always have to laugh at people that say they can't afford to eat fresh, healthy, local food. I also laugh when people expect farmers' markets to have EVERYTHING. Come on folks, learn what SEASONAL is. No, we don't have green beans--they're not producing yet. No, apples usually ripen for picking in the fall. So back to the affordability. I scored a bag of beet greens ($1), a bag of new potatoes ($3), and a bunch of onions ($1). I came home and used half of the potatoes, half of the beet greens, and one onion. What did we have? Roasted dilled potatoes (with olive oil, salt, pepper, and dill), beet green salad with white balsamic vinegar and some fresh ground pepper, plus some reheated home-raised chicken. Total cost for the meal for four? $2.20 for the veggies (OK, I'll even tack on $1 for the oil, salt, pepper, and dill), probably $3 for the half-pound of chicken that I used. We had mulberries from our trees for dessert. So, our family of 4 ate tonight for $6.20. SIX DOLLARS AND TWENTY CENTS. You can't afford to eat healthy? I don't buy it (pun intended). My kids absolutely inhaled their dinners--they pretty much just said MMMMM a lot, with the occasional YUMMY!! thrown in. 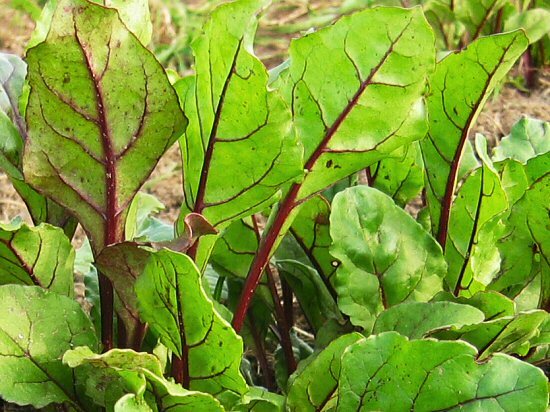 How many kids haven't ever heard of beet greens, let alone be eager to eat them? They're jam-packed with vitamins and they're pretty too. Don't you want some of those? They're so versatile that it isn't funny. Use them fresh in a salad, saute them, stir fry them, use them in soup . . .wow. Of course, you know I'm spoiled on my fresh eggs too (and apparently are a lot of other people--I'm having trouble keeping up with demand!). Yeah, I charge $3 a dozen for mine, and those egg-shaped, chlorine washed things you get from the store are $1 a dozen. Still, when I know mine pack 3x the nutrition (and heck, I'm on a first name basis with all my hens! ), I think it's worth it. After all folks, can you afford NOT to eat healthy? What's more expensive: paying an extra buck or two for good produce or a doctor visit for health problems? As more and more crops are becoming adulterated with GMOs or pesticides, isn't it worth it to look for your local farmer? Come on, I dare you. Try it. Go to the market. If you can feed a family of 4 for less than $6.20, I want to hear your recipes!! !